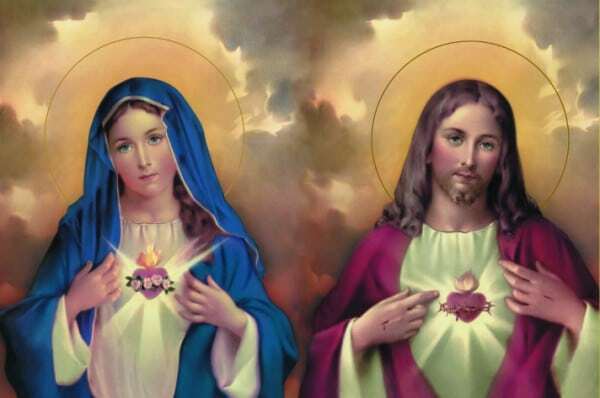 What is the meaning of the Sacred Heart and the Immaculate Heart? 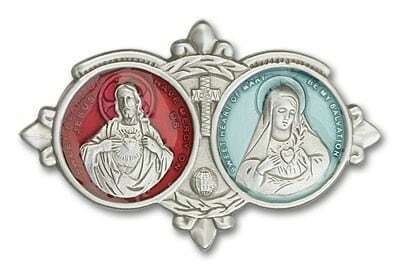 Home » Catholic Art and Symbols » What is the meaning of the Sacred Heart and the Immaculate Heart? 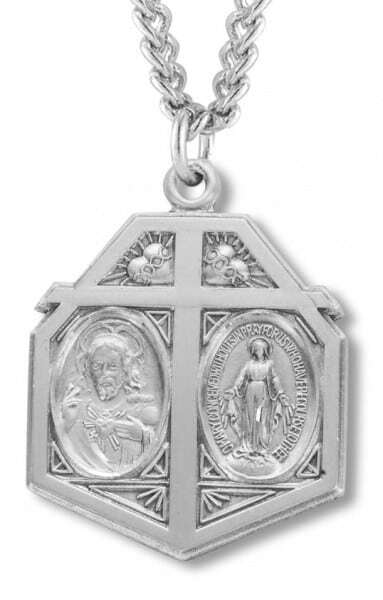 Catholicism is rich with stunning, faith-inspiring iconography as reminders of the Truths of our Faith. Holy Scripture inspired many of the world's most recognizable and beloved artistic masterpieces. Think of Michelangelo's Pieta and ceiling of the Sistine Chapel, Da Vinci's Last Supper, Bouguereau's L'Innocence-- created by gifted artists imbued with God-given talent. Some of the most striking images are not man-made but given by the Lord Himself: the Shroud of Turin, Our Lady of Guadalupe's miraculous image on Juan Diego's tilma, the Sacred Heart of Jesus. The image of the Sacred Heart consists of His Heart, wounded by the lance in His Passion, and precious drops of blood; it is surrounded by a crown of thorns, a cross, and is aflame. 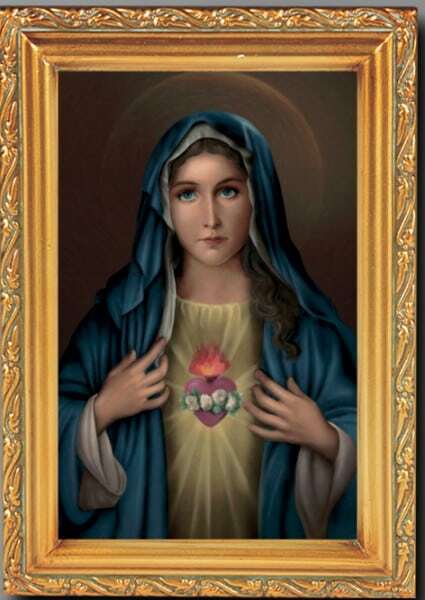 Honored alongside the Sacred Heart is Mary's Immaculate Heart, consisting of her contemplative, maternal heart, wreathed by a crown of roses, pierced with a sword, and alight with fire. 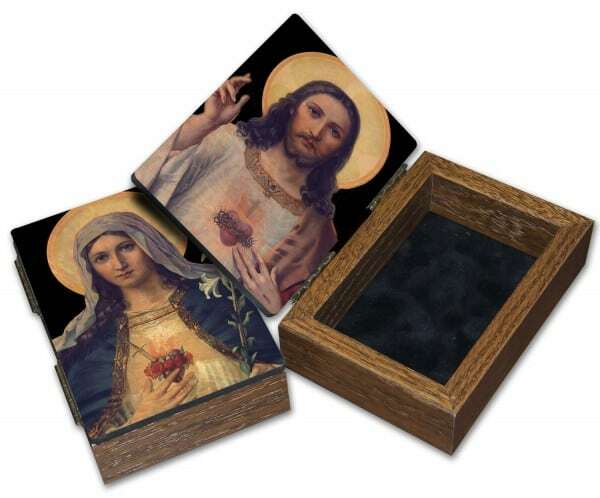 Before we examine what each aspect of the images represents and how the hearts are both similar and different, it would do us well to understand how these devotions took hold in the Catholic Church, and why they are so firmly embraced, even centuries later. The devotion to the Immaculate Heart was becoming popular around the same time as the Sacred Heart devotion but was more muted. The visions of Mary appearing to St. Catherine Laboure in the 1800s and the subsequent propagation of the Miraculous Medal intensified devotion to the Immaculate Heart. St. John Eudes, a priest in the 1600s who had a deep passion for the both the Sacred and the Immaculate Hearts and wrote extensively on both, firmly espoused the connectedness of the two devotions – that one was not complete without the other. "The Heart of Jesus is of course distinct from that of Mary and surpasses it infinitely in excellence and holiness. Yet God has so closely united these two Hearts that there has never been and never will be a closer union. 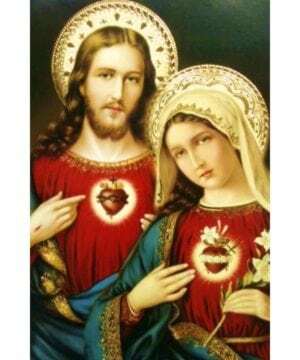 "Thus the Sacred Heart of Jesus is the Heart of Mary. These two Hearts are but one Heart ... which was given to us by the Blessed Trinity and by our Blessed Mother, so that we, the children of Jesus and Mary, might have but one heart with our Heavenly Father and our holy Mother and that we might love and glorify God with the same Heart, a Heart worthy of the infinite grandeur of His Divine Majesty" (The Kingdom of Jesus). 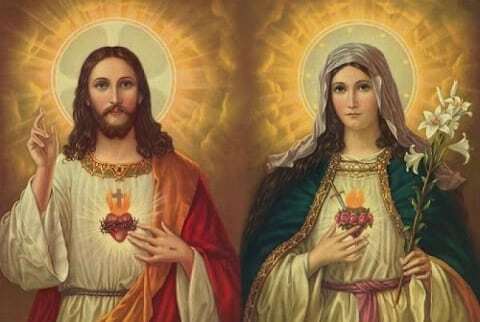 The images themselves demonstrate the many similarities between the hearts and the sufferings of our Lord and our Blessed Mother, but also differences quite specific to their particular sufferings. Both hearts are aflame, but the Sacred Heart's burning love is directed toward humanity, and the physical suffering portrayed in His image is for the sake of mankind: the lance wound in the heart, the crown of thorns, the drops of blood. Throughout His physical suffering, Christ remained committed to the Father's mission for Him. This draws our focus to the intense human suffering endured by our Lord on our behalf. The Immaculate Heart's fire illustrates the burning love Mary has for God the Father and for her Son. Mary's heart, pierced with a sword to remind us of the sorrows she endured silently in her lifetime as Jesus's mother, is ringed with a wreath of roses. The flowers symbolize that, throughout her spiritual suffering, Our Lady remained committed to the humility, obedience, and purity for which we revere her. How Can We Show Devotion to the Sacred and Immaculate Hearts? There are several ways to honor the Sacred and Immaculate Hearts, all of which deepen our fervent dedication to the Faith and shower us with special graces. When she appeared to the children at Fatima, our Lady bade them to dedicate five First Saturdays to her each year. This practice includes going to Confession, receiving the Eucharist, praying the rosary, and meditating on the mysteries of the rosary for 15 minutes. In addition, we celebrate the Feast of the Immaculate Heart of Mary every June 8. The entire month of June is devoted to the Sacred Heart of Jesus. 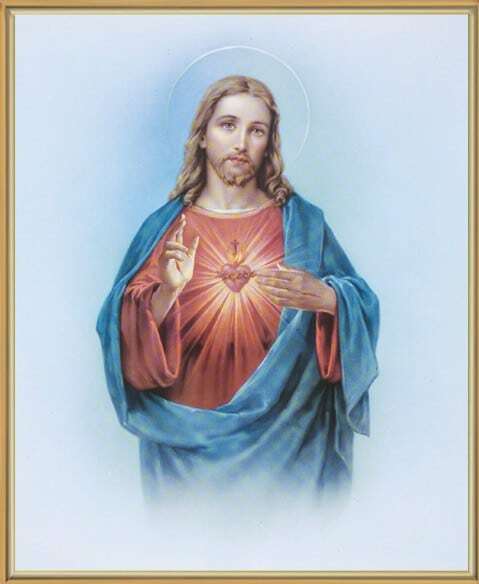 The third Friday after Pentecost is the Solemnity of the Sacred Heart of Jesus (May and June are rich with Solemnities!). Year-round, we can follow our Lord's own instructions to St. Margaret Mary Alacoque: go to confession and receive the Eucharist at Mass on nine consecutive First Fridays. Christ also promised abundant blessings to families who consecrate their homes to His Sacred Heart through an enthronement ceremony. There are many unique ways to celebrate these feast days, in addition to observing the First Fridays and First Saturdays and consecrating your home and family. You may enjoy incorporating cuisine and handicrafts into your celebration, especially as you create liturgical traditions for your children. These devotions will aid you in meditating on the lengths Jesus went to for your salvation, on our pure Mother Mary, and on making reparation for the pain our world continues to inflict on them through our sin and lukewarmness.